Principal Cast : Joan Fontaine, Laurence Olivier, Judith Anderson, George Sanders, Reginald Denny, Gladys Cooper, C Aubrey Smith, Nigel Bruce, Florence Bates, Edward Fielding, Melville Cooper, Leo G Carroll, Leonard Carey, Lumsden Hare. Synopsis: A self-conscious bride is tormented by the memory of her husband’s dead first wife. Rebecca is notable in almost innumerable ways, not the least it being Alfred Hitchcock’s first film following his move to America, and the first of his two Oscar-nominated films of that year in the Best Picture category – the other being the excellent Foreign Correspondent. 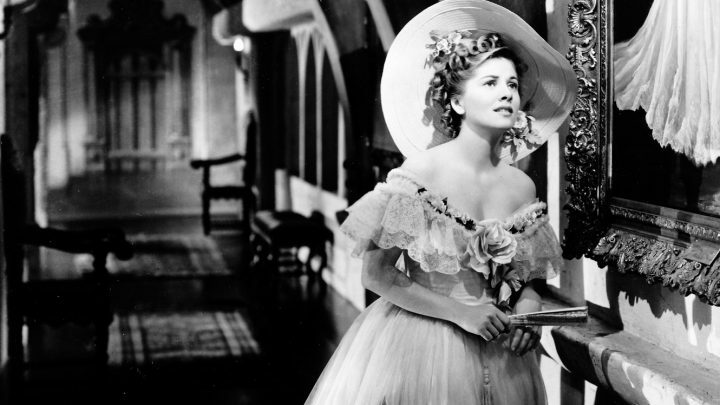 A gothic psychological thriller, Rebecca is based on the top-selling book by Daphne du Maurier (in whom Hitchcock delved for Jamaica Inn in 1939, and The Birds in 1963) and stars Joan Fontaine in her breakout sophomore role, Laurence Olivier (known for his Shakespearean stage work, alongside a large list of screen credits), and an ominous Judith Anderson, Rebecca ended up being nominated for a total of nine Academy Awards (it would win in the Cinematography category, as well as Best Picture) and strengthened Hitchcock’s auteurship in Hollywood’s blistering studio system. A young woman (Fontaine) arrives in the South of France with her employer, Mrs van Hopper (Florence Bates), where she meets the dashing and enigmatic George “Maxim” de Winter (Olivier), with whom she falls in love, marries, and moves to his lavish estate, Manderley, in England. 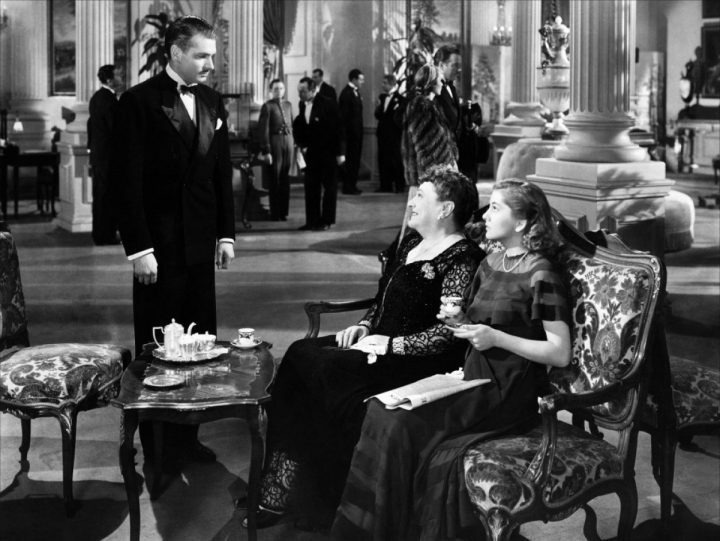 Maxim’s past soon becomes a problem for the Second Mrs de Winter (as she is known), with the estate’s household staff – including the cadaverous Mrs Danvers (Judith Anderson), the skeletal Frith (Edward Fielding) as well as Maxim’s sister Beatrice (Gladys Cooper) and her husband (Nigel Bruce) – constantly comparing the young girl to Maxim’s recently deceased first wife, Rebecca. As she struggles to acclimate to her new life, the second Mrs de Winter tries to ingratiate herself into her new husband’s world, only to find herself stymied by an increasingly crazed Mrs Danvers. It’s only when the muddied truth about Rebecca’s untimely demise comes to light, that she is forced to chose between self preservation and the life she’s chosen with Maxim. The film’s dual narrative pivot involves the subjects of identity and the concepts of shadow. The leading character is never identified by a christian name at any point, remaining “the second Mrs de Winter for the film’s entirety, and it’s this assumed sense of identity which Hitchcock uses to associate imbalance and unkempt personality traits as the story progresses. The young woman desperately tries to live up to Rebecca’s legacy, to create for herself and her new husband a sense of identity within herself that wasn’t there on the blank-slate character we meet at the film’s opening. Once she realises she cannot, not ever, it becomes less a story of her assumed identity and her identifying as her own woman, something which fuels the climactic dramatics of the film’s visceral conclusion. The character’s search for identity amid the shadows of Manderlay’s cavernous ballrooms and staircases, and her struggle to draw emotional breath from a husband who seems distant and angry with her for no particular reason, is crucial to the film’s acutely increasing sense of dread. 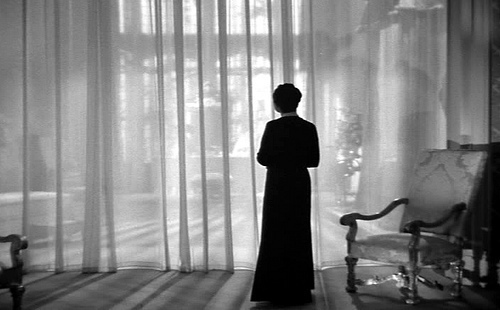 The other aspect to Rebecca, that of shadows, is indicative of both the characters’ often hidden motivations and backstories, as well as the overall visual palette employed by Hitch. 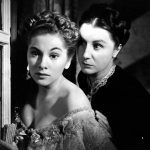 When the second Mrs de Winter arrives at Manderley, the film moves from a fairly bright French setting to a grim, maudlin estate filled with dark rooms, darker passages, and a lot of hidden pain. 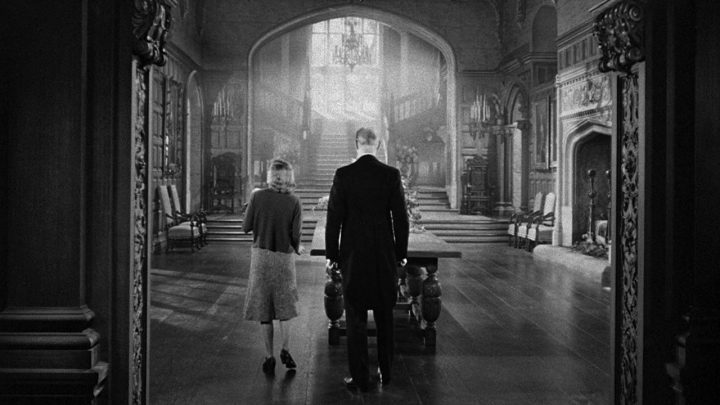 Manderley’s opulence is drowned in a sea of grey and dark shadowy corners, like clouds drifting across the moon (a motif which kicks off the film’s electrifying opening credits and poetic recitative) and keeping things not-quite-clearly-seen throughout. Hitch’s use of shadow and utter black, particularly with respect to the heinous Mrs Danvers and her insistence in looking like she’s midway through converting to some kind of vampiric state, are among the film’s many, many visual highlights. 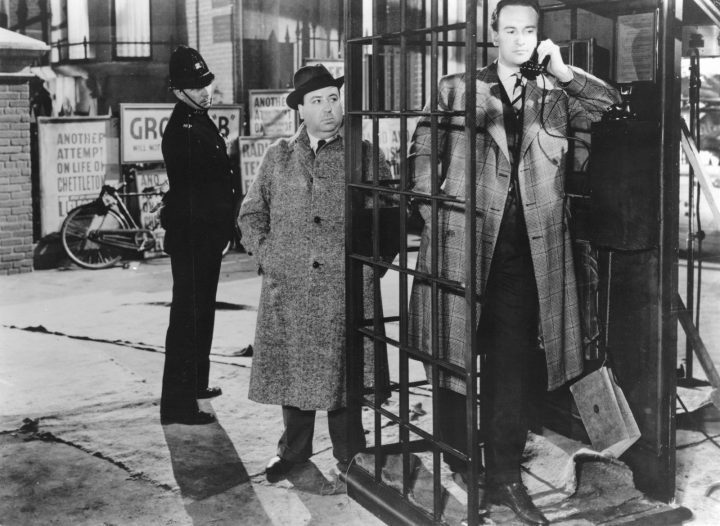 The shadows of Manderley are obviously analogous to the mental state of the characters within, including Maxim himself, who harbours a deep secret that comes to light late in the film, whereby he’s accused of murdering his first wife in a thrilling sequence co-starring the baritone magnificence of George Sanders (who had appeared in Hitch’s Foreign Correspondent, as well as an early Saint movie). As the film moves into darker thematic territory, Hitch employs less grey shades and more stark black and white, accentuated by the crisp monotone photography the film enjoys. Rebecca’s thematic depth is nigh incalculable, a masterwork of subtext, nuance and cinematic prose. While I did have difficulty getting past the aloofness of all the characters save Fontaine’s, and couldn’t for the life of me get past how awful they all were to the poor girl (even Oliver’s Maxim, who treats his wife with the affection a turnip might treat a goulash, is shudderingly misogynistic) but if you can contextualise this specific style of storytelling then Rebecca works a treat. 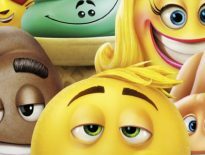 I have to admit, it took me most of the film to “get it”, but once I did, I really enjoyed it. Rebecca is a startling, enormously suspenseful dramatic film for Hitchcock. Incredibly atmospheric, beautifully shot by DP George Barnes (Sampson & Delilah, Here Comes The Groom, The Greatest Show On Earth), and once again showcasing Hitchcock’s astounding command of frame composition and editing, the film’s success and legacy as an outright classic of the genre are undiminished by the passing years. With its literary foundation being so acutely transcribed by screenwriters Robert Sherwood and Joan Harrison, the film is labyrinthine in tone and practically oozes menace in virtually every frame. 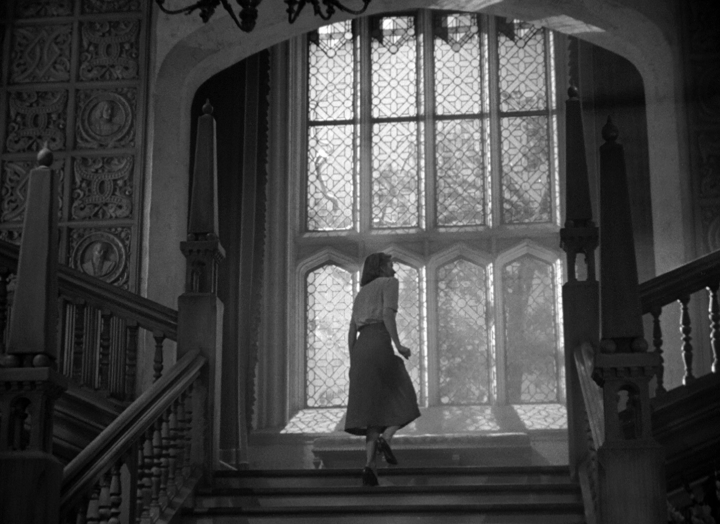 Hitchcock’s ability to create a sense of impending doom, of oncoming tragedy, is innate to his films (particularly his American ones, IMO), and Rebecca sets its scene early with a masterful use of model photography (the wide shots of Manderley, the impressive estate owned by Maxim, are accomplished by matte paintings and a detailed mock-up of the property) and encompasses a multitude of cavernous sets, with the film’s leads shot entirely on sound-stages even when the on-screen location is exterior. Rebecca’s plot is perfectly adequate fodder for Hitch’s brand of brain-bending audience-torture. Fontaine’s character is a prototypical wide-eyed innocent, perfect for Hitch to imbue with a sense of “lamb to the slaughter” in Maxim’s wealthy, aristocratic world, and Fontaine delivers a breathless, tremble-lipped performance that starts off uneven but solidifies by film’s end. Olivier, for his part, is bizarrely aloof for a supposedly romantic lead, offering scant depth other than crease-browed thought and hidden pain (which is examined in far more depth in the film’s final act). For the film’s villain, Hitchcock engaged the wonderful Judith Anderson, one of the great stage actresses of the time, who it is intimated may have had more than a simple employee-employer relationship with the late Rebecca. A scene involving one of Rebecca’s negligees and it’s see-through nature will make your skin absolutely flinch with ickiness. Anderson’s matriarchal appearance and ability to make one’s skin crawl with simply a glance is astonishing, and the actress’s screen presence is magnified by Hitch’s photography of her. She commands the screen almost every time she’s on it, dwarfing even the luminous Fontaine with her steely-eyed vulture-ish glare; Mrs Danvers’ constant revival of Rebecca’s lasting legacy on Manderley is insidious and pernicious, and a scene in which she exhorts a broken Mrs de Winter to leap to her death from a high window is mesmerising for its inherent evilness. Secondary roles to the aforementioned Sanders, a wonderful Florence Bates as a participant in the film’s opening French-set sequences in what I would call “Kathy Bates as Molly Brown-esque”, and Melville Cooper, as the coroner investigating Rebecca’s death (for the second time), are all flexibly charismatic, giving depth to the film’s sense of unease and associated legacy, while small roles to Leonard Carey, as a PTSD-afflicted hermit on the Manderley beach, Reginald Denny and C Aubrey Smith live on the fringes of the film’s sense of gothic horror. There’s an impenetrable closeness in Rebecca that threatens to thwart even the heartiest of viewers. 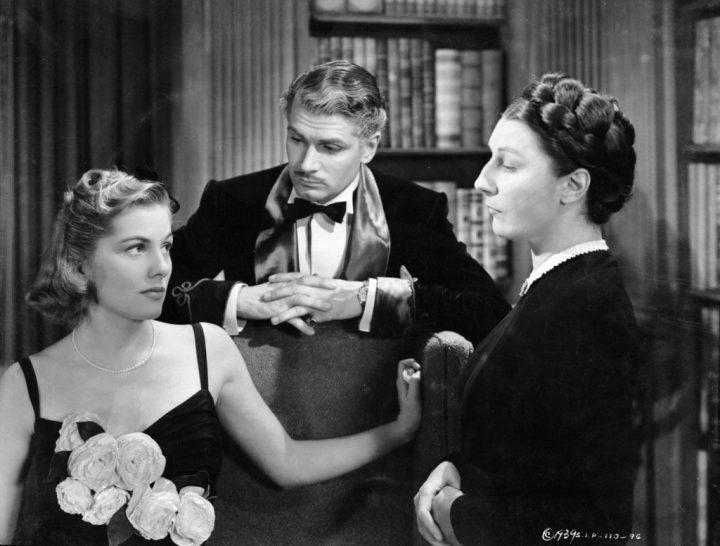 The suffocating sense of Rebecca’s presence throughout the film is indicative not only of her shadow over the characters within the story, but also connected to Hitch’s production of it. The film’s opulence and sheer screen beauty (and it is a beautiful film in almost every respect that I can think of) is contrasted by the darkness and despair felt by the characters, all of whom harbour desires, anger, resentment and even insanity as Fontaine’s foundling replacement wife threatens to brighten up a life now soured by sorrow. This complementary disparity (there’s a statement I never thought I’d write) is one of Hitchcock’s most astute cinematic creations, thrusting a perfectly innocent and wonderful soul to the narrative equivalent of a pack of wolves and seeing if she makes it out alive. 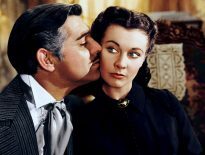 Rebecca is a magnificent, hypnotic, occasionally terrifying affair, with Hitch’s patented sense of rhythm and pacing generating white-knuckle fear at crucial moments of the film’s salacious third act. While the acting takes some getting used to, and the characters (Fontaine’s aside) are decidedly unlikable for the majority, Rebecca’s tone and thematic texturing is sublimely exploratory in a way I had not expected for a film of this vintage. A deserving winner of Best Picture and a superlative opening salvo for Hitch’s American career.